What on earth is this about? I've studied the symbolism and significance of bears in Judaism very extensively, and I have never come across any connection to grapes. Google didn't help me, either. Does anyone have any insights? In other news - I am currently planning my summer lecture tour in the US. I have availability for Shabbos July 21 in the NY region, and July 28 and August 11 in California. If you are interested in arranging a scholar-in-residence program, please write to me. is the motif of animals carrying clusters of grapes prevalent? If so then this may just be variations on a theme (probably based on their name as 'S' mentions). If not, perhaps there is some connection to the meraglim, but this would require more investigation. thanks for the brain teaser. "The symbols themselves carved on the headstones are also interesting. Apart from common ones such as trusses of grapes or pine cones, which meant fruitfulness and diligence, "
I like Moshe's idea of relating it to the meraglim. Perhaps it's a play on "וַיּוֹצִיאוּ דִּבַּת הָאָרֶץ אֲשֶׁר תָּרוּ אֹתָהּ"? A bit of a stretch and seemingly unrelated to anything someone would want to have on their tombstone, but you never know. No, that's all I've got. Well, we can safely assume their name was Dov or Bear. Now back to the grapes... I guess the imaginary of bears carrying clusters of grapes is just an artistic licence (inspired by Meraglim). 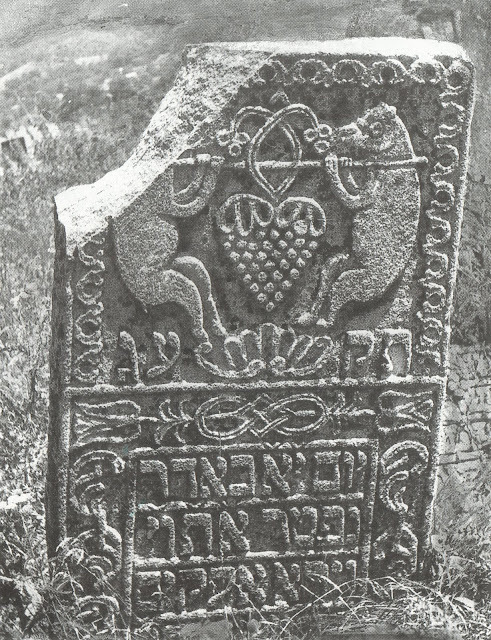 There are plenty of gravestones showing the name animal and grapes separately. If the idea is to portray two spies carrying a cluster of grapes, then perhaps the mason wanted to avoid carving the human form into stone (idolatry?). Bears were then substituted because of the deceased's name. The lion represent royal imagery. This still doesn't answer why someone would want spies and grapes on their tombstone. It could be that they wanted to use images of bears because it was less "offensive" than images of people. Just a guess. What do you mean by the New York area? Are you only going to be within New York itself? In the 1930s-1940s, he focused mainly on genre prints and illustrations to books by Jewish authors – U Dnepra [“At the Dnieper”] (1933) by David Bergelson, Puteshestiye Veniamina III [“The Trip by Benjamin III”] by Mendele Moicher Sforim (1935), “Jew Suss” by Lion Feuchtwanger (1938–1939) and Istoricheskiye romany [“Historic novels”] by Olga Forsch (1949). In the 1930s, he continued his “Yesteryear” series (“Musicians Returning from a Wedding Party”, 1939, and others) and made prints based on the Jewish folk art motifs (“Two Bears Carrying Grapes”, 1940). From David's links it would seem that grapes are in fact a common motif either indicating the person's occupation )related to viticulture and oenology)or representing fruitfulness. ish haeshkolos - that might explain the grapes and his name might explain the bears. Apart from the obvious associations with wealth/fruitfulness and the already mentioned Dov/Baer aspect, what I find fascinating is the beautiful aesthetics and imagery that our pious forebears were happy to associate themselves with. It's refreshing when compared to the minimalist and sterile inscriptions we see in this day and age and shows how some things have changed for the worse IMO. That's not a such an easy thing to say. The other approach is to say that the modern philosophy of "form follows function" is an improvement over the elaborate designs unnecessarily added onto all sorts of manufactured things. Your "minimalist inscriptions" are part of a movement to do away with the frivolous decorations of generations past. I too can not offer anything in reagrds to the bears. 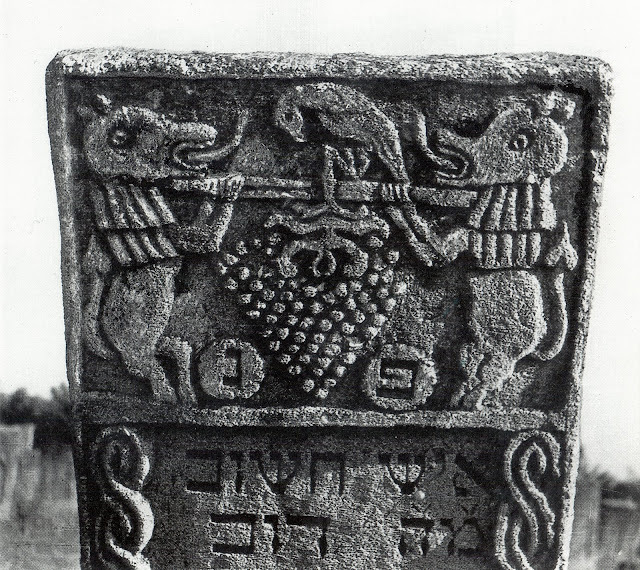 Perhaps the oversized grapes has something to do with the midrash's depiction of the "Meraglim" bringing back the oversized fruits from land that they scouted. Perhaps the simple understanding is that the names were Dov and that they were בעלי אשכולות. 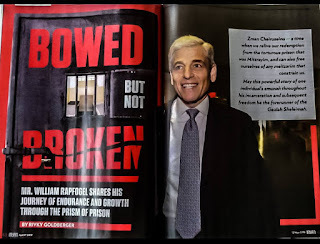 As per the גמרא סוטה מז ע"ב. "The graveyard [of Prague] is a wonderful place...From the inscription on the gravestones mat be seen of what root the deceased was. If of Aaron, a pair of hands... if of Levi, a chalice..., if of Israel, a bunch of grapes, a lion, fish or hen, betokening that such was the deceased's name." "A Glance at Prague", Fraser's Magazine, September 1846. It's clear that his name was Dov and he was a ישראל and not a Kohen/Levi. 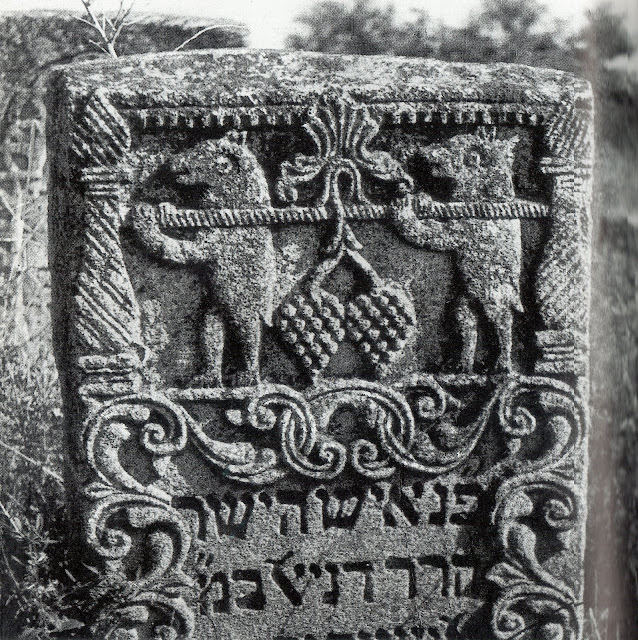 Why should the symbol of non-Kohanim/Leviim be davka grapes? I can only guess. Perhaps grapes refer to wine which can be consumed freely by ישראלים who don't serve in the בית המקדש. Natan, don't forget that many Jews were in the wine and spirit business back in the day. Perhaps that has something to do with it . . . Here's one explanation of a connection, though perhaps a tenuous one, based in part on Yirmiyahu (see the link). "One of the Hebrew words for a cave or den (the ‘tent’ of the bear) is מאורה ‘meorah’ which comes from the root אר meaning light and order. A cave is a place of darkness yet has a lighted whole when viewed from the inside. The Hebrew word for the ark of the covenant is ארון ‘aron’ which comes from this same Hebrew root. The ark was a box, which is a device used to arrange and order articles. The Tabernacle/Temple was a place of darkness whose only light was the Menorah in the Holy Place and the Glory of YHWH in the Holy of Holies. Here we see a connection between the den/cave of the bear and the House of YHWH. Scripture further links these concepts by picturing YHWH as a bear. When YHWH judges the earth it is likened to a bear robbed of her cubs. The Hebrew word for this bereavement is שכל ‘shakal’ which is literally means a loss of children. Interestingly the Hebrew word for a cluster of grapes, אשכול ‘eshkol,’ is a cognate of this word. The roaring of YHWH in judgment as a bear robbed of her cubs is linked to the ‘grapes of wrath’ spoken of in Revelation." 1. Maybe the symbol was not intended to be a Jewish one, and is somehow connected to allegiance to Russia whose symbol is the bear? 2. Maybe they were in some way required to put a Russian symbol on the stones, and alluded to the fact that their allegiance was not to Russia by remembering the meraglim. 3. Perhaps whoever wrote the text for the first matzeva was slightly illiterate. “Ish chashuv mah DOV.” Could he have meant tov? Or was it a play on words? Seems you are not the first to question this. Here’s another bear on what I think looks like an American matzevah. The explanation given is that they used the bear to indicate that the person was pious. Maybe in some way the grapes reflect the fact that acharei meah ve’esrim one comes bearing (ouch) the fruits of their accomplishments. Well this would be more than 'slightly' illiterate! LOL! I think it means Moreinu Harav Dov. A bear was the striongest animal in Eastern Europe and they loved drinking in those lands. However, the wine was rare and expensive. The picture depicts Olam Habo according to their understanding: the strongest animal is bringing the greatest delicacy to Moreinu Harav Dov as a reward for his labor in this world. This can be understood literally or alligorically if one wants to go rationalist. one interesting aspect that no one's answers has seemed to address. there is a similarity in tht the bears are carrying the grapes on a pole. if it was just a combination of grapes and bears (meraglim,occupation,names etc.) y would there b such a strikingly similar characteristic in all 3? Bear is a King of the Animals, wheBear is a King of the Animals, when there are no Lions around. Bear on those pictures, in my humble opinion, has nothing to do with Jewish traditions. More likely, the bear imagery has European origins, where bear is the biggest and and strongest creature. I was worshiped and assigned mystical powers by pagans, way before christianity came to the area. Bear is symbol of strength, quickness and savviness, making him a hero of many fairy tales and folk stories and art, making it similar to Lion in Judaism. Even in modern times, bear is the talisman of two Olympic games: Moscow (1980) and Sochi (2014)n there are no Lions around. Dov means Bear but one can spell it Beer. Or maybe they were in the beer and wine business? The first image of bears carrying grapes (Sadgora, 1813) appears in the book "Carved Memories. Heritage in Stone from the Russian Jewish Pale" by David Goberman. It suggests an interpretation for the image page 85: "Bears carrying grapes on a staff. The deceased died 11 days into the month of Adar, which is just before the holiday of Purim. It is possible that the grapes signify the drinking of wine, which is traditional at Purim. However, it is more likely that the carrying of grapes on a staff is symbolic of a story in the Torah. During the period of wandering in the desert, Moses sent spies on a reconnaissance mission to the Promised Land. They returned carrying grapes on a staff, representing the potential abundance to come." Review of "The Secrets of the Stars"
Why On Earth Would One Eat A Kezayis?